This the second part of a two-part article, “How To Train For A Million Years.” You can read the first part of the article here. As human beings, we have a finite amount of time that we can spend improving our martial arts through keiko, and this creates an absolute limit to how much we can learn in one lifetime. In the first part of this article, Saotome Sensei explained that investing ourselves completely in our training as if each moment was our last; by balancing strength with relaxation, attentiveness with “letting go”, tension and freedom, we can manifest ourselves fully and tap into the hidden aspects of in our potential. In this second article, Sensei explains how each of us are the products of millions of years of evolution, and that when we attack and defend we are in fact relying heavily on instincts, reflexes, and movement chains that have been provided by Nature. Although we tend to think of these things as under our constant conscious control, they are not and cannot be. Sensei describes how we should change our training from repetition to exploration, and discovering the underlying principles of biofeedback and movement that provide a gateway to more powerful and astonishing Aikido technique. Saotome Sensei talking about “biofeedback response” at the 12th Street Dojo in Sarasota, Florida. To “wrap my head” around Sensei’s “biofeedback” principle, to find a framework for explaining what is happening and a direction of exploration, I have started to investigate the concept of proprioception. Proprioception, in simple, is your body’s mechanism for monitoring, measuring and controlling its position in space, and the force exerted by and felt by your muscles. You have sensors inside your muscles that relay feedback on weight (heaviness), and the contraction/use of your muscles – in essence, where your body is and what your body is doing, and whether or not it is performing as expected with or without conscious monitoring. Proprioception is tied closely with muscle memory and unconscious movement, even to a certain extent our sense of balance and our ability to accurately interact with our environment. When there is a dysfunction with our proprioception, we may have difficulty walking, we may be clumsy or use too much force, and we have difficulty matching our movements to our intentions. We all have to use the programs that Evolution gave us. From a martial standpoint, there is a transition between intentional goal setting and execution by your body that is handled by proprioception. There is one proprioception experiment that I found very informative, and which I think illuminates the opportunity for martial study. In this experiment, a subway stairwell was altered so that a single step was raised 1/2″ (about 12mm) from all the others, and the stairwell was filmed so that the responses of random people going up and down the stairs would be recorded. Unsurprisingly, a great majority of people tripped or stumbled on the odd step, even though the offending step was not actually high enough to interfere with the pedestrians’ feet. What happened was that at the beginning of the steps, the pedestrians made an assessment of the stairwell (“normal stairwell, easy to navigate, consistent steps”) and put their feet on automatic pilot. When there was a discrepancy – the sensors in the feet and leg reported that the initial assessment was incorrect – the normal ability to navigate and climb or descend the stairs was disrupted, and in fact they had a disproportionate stumbling disruption across their entire body. 1/2″ difference, no tripping – yet major stumbles! In contrast, when one is trying to climb a rocky mountain path, one is less likely to stumble because the initial assessment sets the expectation that the footing will be unstable, and as a result we maintain a certain amount of attention, defensive control, adaptability, and response on our foot placement. I think the implications of this are amazing! To me, this indicates that as long as our attacker is encouraged to believe they do not need to pay attention to their hands, feet, or balance, they are susceptible to interruption and disruption effects; but if we cause them to be overly defensive and self-aware through forced movement, we may make our tasks as Nage harder. Uke wants to punch nage (establishes an objective). Uke assesses situation and collects variable inputs (Nage is positioned thusly; target is selected; necessary vector and force and timing identified to achieve goal). Uke executes “Punch To The Head” program (stance grounds, fist chambers; aligns; fist accelerates along designated path toward target; fist continues until target is struck, punch is completed, danger or program failure is detected). Notice at Step 3, Uke is no longer focused on goals (what they want), but instead has translated the goal into physical actions that hopefully will achieve the desired goals (what they are actually asking for). Once the program starts, and if the training situation is intense, Uke no longer has the mental bandwidth or even desire to continue controlling the fist through the punching process. Instead, Uke must rely on the Punch program to execute successfully; and if they are a boxer or fighter or martial artist, they have repeated those motions thousands of times and have reached great confidence and reliance on that program. As long as we allow Uke’s Punch program to continue without receiving “major error” or “completion” signals, Uke should remain committed to that program. The same is true for “walk forward to close distance”, or “execute block to protect from strike”, or “move body to recover balance and reorient on threat” programs – or in the case of Saotome Sensei’s demonstration, “stay strong/stable and don’t let the fist be moved” program. If Sensei used overwhelming force that made Uke’s goal state impossible (for example, by forcefully pressing Uke’s arm down with both of his arms, or by throwing Uke using their head/body), Uke would quit trying. However, since Uke feels like they are continuing to succeed at keeping their posture and are so close to realigning their fist to the goal state, Sensei can continue to use Uke’s tiny overcorrections to disrupt their balance and structure. Some of the things Sensei accomplishes with “biofeedback” are kuzushi (offbalancing, as I’ve just described), de-ai (gaining timing while Uke continues trying to complete an attack that can no longer succeed), suki (creating openings for striking or to gain the centerline), and even nagewaza (throwing, or disproportionate stumble / flinch / recovery response that results in Uke falling). Sensei makes these happen by not disrupting these internal programs but also not letting them quite generate the desired objective, or sometimes by causing an over-reaction in the direction Sensei desires. Of course, Saotome Sensei has never used the term “proprioception,” and he did not arrive at his understanding through a scientific analysis of muscle spindles, neuromotor sensors and biological kinesthetics. Instead, he is a deeply intuitive and sensitive martial artist, and he gained his insight through watching people, feeling the responses of his training partners, and closely observing animals in nature respond to each other. To him, “biofeedback” is another form of aiki; it is sensing the natural vibrations and energy of one’s opponent, and letting it express itself naturally while adapting it to another, more harmonious, goal. Normally we think of this blending of energies in terms of great lines and spirals (external), but for Sensei the deeper expression of these lines and spirals is almost imperceptibly small and instantaneous and contained in the connection point between Uke and Nage. To move our point of study – while still maintaining dynamic attack distances, speed and power – is to move our study from the external to the internal, from the manipulative to the responsive. 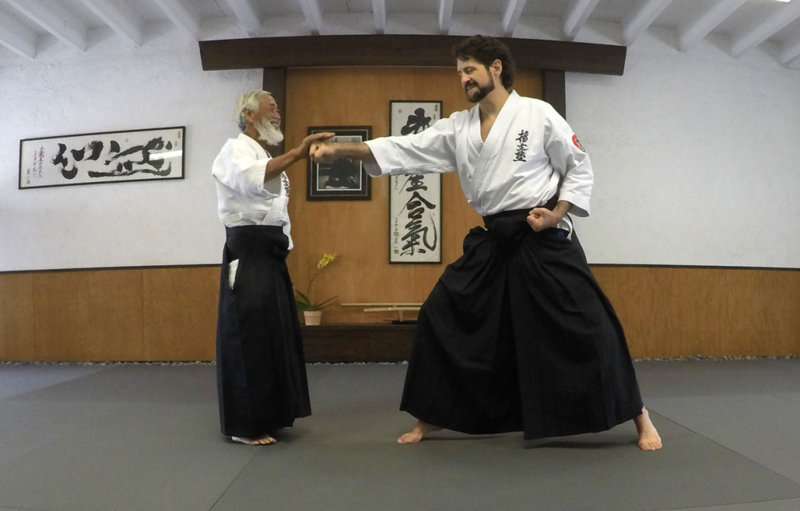 Martial biofeedback is an immense topic that could provide decades of deep study, but Saotome Sensei urges us to consider it a gateway to a new way to train and even to think about our study of aiki. As Sensei reminds us – “20 years, 30 years on the mat is no guarantee of your training.” Whether you approach it from an analytical direction as I have, or choose to explore it from a purely intuitive and sensitivity framework as Sensei has is up to you. Material from this article was collected over a number of interviews with Saotome Sensei, but most notably from a personal visit on 12/8/2015 (Sarasota), and at ASU Winter Intensive in St. Pete Beach (January 4-5 2018). An additional quote was from Sensei’s instruction at 12th Street Dojo (Sarasota, Florida) on 3/11/2018. I enjoy reading this. I thinking of taking aikido. Great work, Guy. I really like how you organized and systematized sensei’s teachings on “biofeedback keiko”. I love the notion of different path of learning allowing one to augment their practice. Thanks for writing! In order to clarify what was happening in the video and how it pertains to the article, I’m posting my response here. “Michael, of course. It takes longer to describe than do! In the video, there are essentially three different levels/attacks sensei is asking from me. On the static ones – such as when I am holding a punch kamae, my goal is simply to try to not be bent or moved, and if I am, to regain my balance. Specifically, it is to keep the fist (or grip) immobilized, and if it is moved, to put it back on center (just like the old sword extension exercise). Of course, I could go limp or walk away at any time, so it is definitely a kihon practice. The second version (not in chronological order) is to enter and punch sensei in the face. That’s essentially it – again, I could let my arm go limp as soon as sensei touches it, or I could “bail” immediately – but the difference here is important as because saotome sensei maintains a body presence where it feels very clear that if I as uke doesn’t maintain the connection, sensei will complete a strike to my head or neck. He isn’t pushing “down” per se, he has a center-to-center presence where the punching hand (off the line / awkward as it becomes) becomes the only thing uke has to keep nage’s counterstrike away from uke’s face. The third version is with the kumitachi (sword) at the beginning. 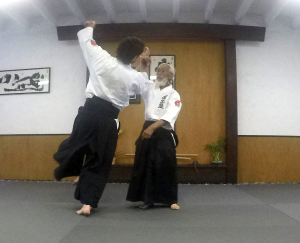 In this, sensei is holding defensive chuden kamae (middle stance), and I am performing tachiware – sometimes call the “beat thrust” attack, the goal of which is to clear nage’s weapon out of the way as part of a smooth thrust up the centerline. It is not two moves, and an important part is to cultivate *not* overcorrecting or overcutting past the centerline. However, sensei has great timing and center presence, so it’s tough not to instinctively try to adapt the thrust to be able to “break through” what feels like a tough defense, which disappears at a point timed to “cut uke’s ki” (split their intention/attention).